King Solomon sheds some light on this ingredient in Ecc. 7: 8b…the patient in spirit is better than the proud in spirit. 9 Be not quick in your spirit to become angry, for anger lodges in the heart of fools. In contrasting patience with pride, it becomes evident that there is an incredible pride resident in impatience; not only because of how we’re convinced we don’t deserve to have to wait on anything or anyone and we certainly don’t deserve to be provoked, but also because impatience proves we’re blind to the things in us that are so very similar to the things in others that rub us the wrong way. 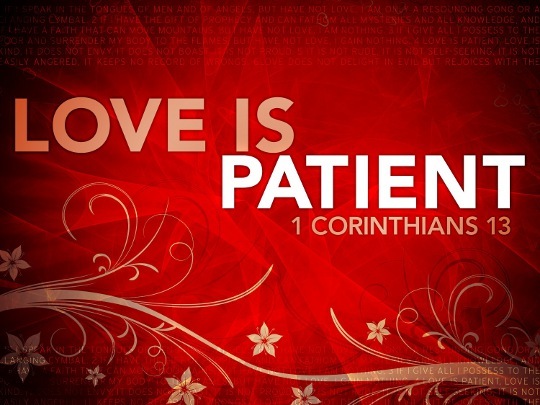 Another way to think of patience is being long-tempered or long-fused vs. short-tempered or short-fused. So, what does it take to light your fuse and how short of a fuse do you have until you blow? It happens pretty fast sometimes doesn’t it? You seem fine one moment and the next thing you know you’re provoked in some way and you’ve said or thought something you now really regret. What’s going on there? Here’s the sad reality: The shorter the fuse indicates the more pride being coddled in the heart. And don’t think of pride only in the self-exalting, boastful sense, but also in the self-pitying, bitter sense. Accordingly, thoughts like–“I don’t deserve to have to put up with this”—can come from both self-exalting and self-pitying dispositions.